Adopted on March 17, 1939. The Cabbage Palmetto, (Arecaceae Sabal palmetto,) was adopted as the "Official State Tree of the State of South Carolina" by Joint Resolution No. 63, approved March 17, 1939. The Palmetto was symbolical of the defeat of the British fleet at Fort Moultrie on Sullivan's Island. The fort was built of Palmetto logs, which absorbed the impact of the cannon balls. The South Carolina Palmetto is classified by the US Department of Agriculture as "Inodes Palmetto (also called Sabal Palmetto) and commonly known as the Cabbage Palmetto." It has long been closely associated with the history of South Carolina, being represented on the State Flag as well as on the State Seal, where it is symbolical of the defeat of the British fleet by the fort, built of Palmetto logs, on Sullivan's Island. 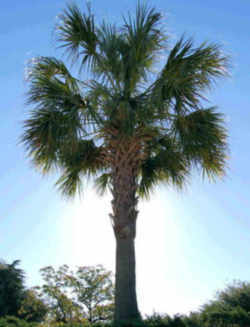 The Palmetto is an attractive feature of the coastal areas of South Carolina and is also found in Georgia, Florida and North Carolina. The large leafbud is highly prized as a salad vegetable for use in making pickles or relishes, and in Florida some use has been made of the fibers from the leaf bases. Such uses, however, are wasteful since the palm must be destroyed in either case and years must lapse before it can be replaced. 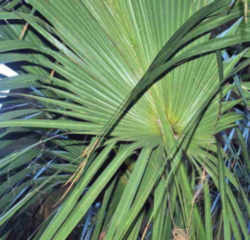 Cabbage palmetto (Sabal palmetto) is the most northerly and abundant of the native tree palms. 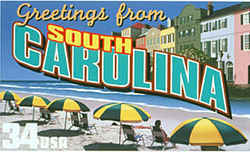 Other names sometimes used are Carolina palmetto, common palmetto, palmetto, and cabbage-palm. This medium-sized unbranched evergreen palm commonly grows on sandy shores, along brackish marshes, in seacoast woodlands of Southeastern United States and throughout peninsular Florida. 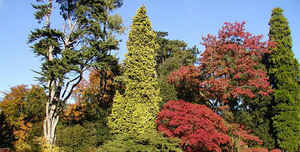 It can tolerate a broad range of soil conditions and is often planted as a street tree. Abundant fruit crops provide a good supply of food to many kinds of wildlife. Leaf: Alternate, palmately compound, fan shaped; leaflets very long (4 to 6 feet) and lance shaped, leaf stalks are long, extend through the leaf, and are without sharp edges; green in color, overall leaf nearly round and several feet long. 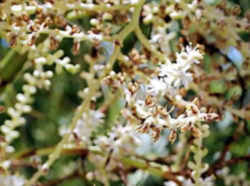 Flower: Small white flowers occurring on large (several feet), branched clusters, appearing in early summer. Fruit: Fleshy drupe, nearly round, 1/3 to 1/2 inch across, dark shiny blue, maturing in early fall and persistent into the winter. 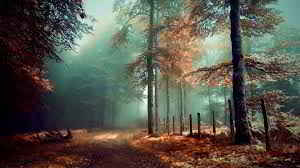 Twig: Absent, since leaves appear directly out of unbranched trunk. Bark: Gray brown, tough, splits vertically. Form: Tall (to 80 feet), straight trunk with a short rounded crown. 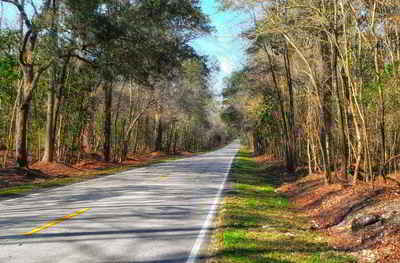 The law designating the palmetto tree as the official South Carolina state tree is found in the South Carolina Code of Laws, Title 1, Chapter 1, Article 9, Section 1-1-660. The palmetto tree is hereby designated and adopted as the official tree of the State. All of the state trees, except the Hawaii state tree, are native to the state.